Seahawk QB: "It give me chills"
"To have (Derrick Coleman) in the huddle, it kind of gives me chills to be honest with you." That's what Seattle Seahawks quarterback Russell Wilson told the media this week about his teammate. Coleman and Wilson will be playing together in Sunday's Super Bowl. Below is a video of the quarterback's comments. 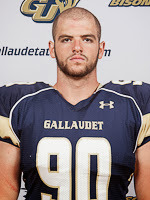 Adham Talaat was a two-time academic all-American at Gallaudet University. He says he now looks up to Seattle Seahawks fullback Derrick Coleman as a role model. Coleman will be playing in the Super Bowl this weekend. Talaat is a "talented underdog who has had to overcome huge obstacles to get where he is. He is severely to profoundly deaf, and he said he is able to hear only very loud noises — like fire alarms — if he is not wearing his hearing aids. The New York Times has more on Talaat's struggle to follow in the footsteps of Coleman and reach the NFL here. Frustrated by the weak captioning provided by Netflix? The Week magazine offers a summary of the situation here, pointing out that that the company has limited options because of copyright restraints. Nevertheless, The Week accuses Netflixs of having "bizarrely low standards" when it comes to captioning and that the "inconsistent" service is "loaded with nonsense." A lawsuit filed by the National Association of the Deaf led to an agreement that Netflix would get its act together by the end of this year. But that agreement apparently says more about getting captions on the video than it does about the quality of those captions. A Northern Virginia theater is offering Shakespeare--with a deaf actor in the lead role. Ethan Sinnott teaches theater at Gallaudet University and he is staring in the NextStop Theatre Company's production of Richard III. There are two other deaf actors playing roles besides Sinnott. The NextStop production is designed for a hearing audience, but there will be four performances offered entirely in ASL. It starts tomorrow evening and runs through Feb. 23 at the Industrial Strength Theater in Herndon. For more info, click here. A breakdown of college endowments at hundreds of schools has been released by the National Association of College and University Business Officers and the Commonfund Institute 2013. Based on this information, a Washington Post analysis of Maryland, Virginia and D.C. colleges related to Endowment dollars per enrolled student puts Gallaudet University at $112,799 per student, giving it a ranking of 12 out 30 area institutions. Read more at the Washington Post here. Tommy Barksdale is chasing his dream in the outfield for the British Columbia Bombers. He's just one of more than 200 players in the California Winter League--but the only one who is profoundly deaf. Barksdale just finished earning his degree from Gallaudet University and now works full-time to make it into the major leagues. Read more about what Barksdale is up against here. UK reality show winner Josie Gibson says her deaf brother was beaten yesterday by some men because he was not able to give them directions. It happened in Bristol, England when the Big Brother star was celebrating her birthday. Gibson Tweeted, "Lost all faith in man kind tonight. I went to the toilet and my brother got beaten up for being deaf!!!" Harry is profoundly deaf as a result of contracting meningitis as a child. A former NTID student will sign the national anthem at Sunday's Super Bowl. The National Association of the Deaf selected Amber Zion based on an audition tape. Zion graduated from RIT’s National Technical Institute for the Deaf a decade ago. Her husband is also a graduate from the Rochester school. She has appeared off-Broadway, major television programs and commercials. Zion has played leading roles for Deaf West Theater and acted in independent films. Soprano Renee Fleming will sing the National Anthem live on the FOX telecast. Here's a video about her selection. An explanation what it what is it like to get cochlear implants in the video below from The Oklahoman. No captions, but you can read the gist of the video here. A group of student researchers from Rochester Institute of Technology’s National Technical Institute for the Deaf have been awarded $25,000 and is one of ten teams acceptance into a business startup accelerator called Leap Axlr8r based in San Francisco. It's for companies building on the gesture-based technology called Leap Motion. The $80 device allows users to interact with technology through motion rather than screens, keyboards, mice, and consoles. The technology is playing a critical role in 3D human computer interaction. The students are working on a program to help the deaf and hearing better communicate. They call themselves MotionSavvy and their application is designed to translate a hand shape into a text letter of the alphabet in sign language. Eventually, they hope it will translate sign language into words and sentences. Read more from NTID here. The FCC wants to know whether video excerpts from broadcast TV should be captioned when posted on the Internet. The Commission already requires full television programs to be captioned when it is put on the internet. The FCC wants comments because when Congress authorized it to require TV program producers to caption videos, lawmakers said that, in time, the requirement would move from entire programs to program excerpts. The question before the FCC is whether this is the time to start making this a requirement or not. Comments are due by Monday, January 27. You can read the notice here. A Denver hospital is being sued for failing to provide a patient a sign language interpreter. The Colorado Cross-Disability Coalition is suing Porter Adventist Hospital on behalf of Cynthia Mullen. A rehabilitation facility is also named in the suit. You can read the suit itself here. The deaf community has lost one of its well-known voices of advocacy. Doug Bahl has died from cancer at the age of 63. He was president of the Minnesota Association of Deaf Citizens for a decade and taught ASL at St. Paul College. You can read here about his lawsuit against Police in St. Paul. He was pulled over in 2006 and beaten during the traffic stop for failing to obey the commands of officers--commands he could not hear. Officers now receive training from the city about how to relate to deaf citizens. The largest cochlear implant maker in the world is facing a multimillion dollar fine. LifeScientist reports that a California jury wants to fine Cochlear Limited $131 million after deciding the Australian company infringed on two patents held by the Alfred E Mann Foundation for Scientific Research, which licensed the two patents to Advanced Bionics. The verdict isn't final--a judge will have to sign off on it. Five investment analysts have given Cochlear's stock a "sell" rating, according to Zolmax. The National Technical Institute for the Deaf is getting an extra $4 million in federal money this year. The funds will provide students with new equipment and keep tuition costs down. It was included with the appropriations bill Congress just passed. Here's Senator Chuck Schumer announcing funding for NTID in Rochester in a video from WHEC-TV. Riley Kovalcik. 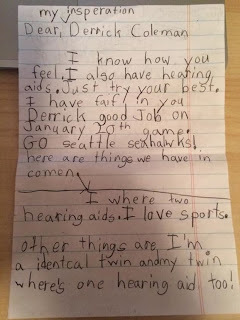 The New Jersey nine year old wrote to Coleman and tried to help him stay confident. "Just try your best," she wrote. 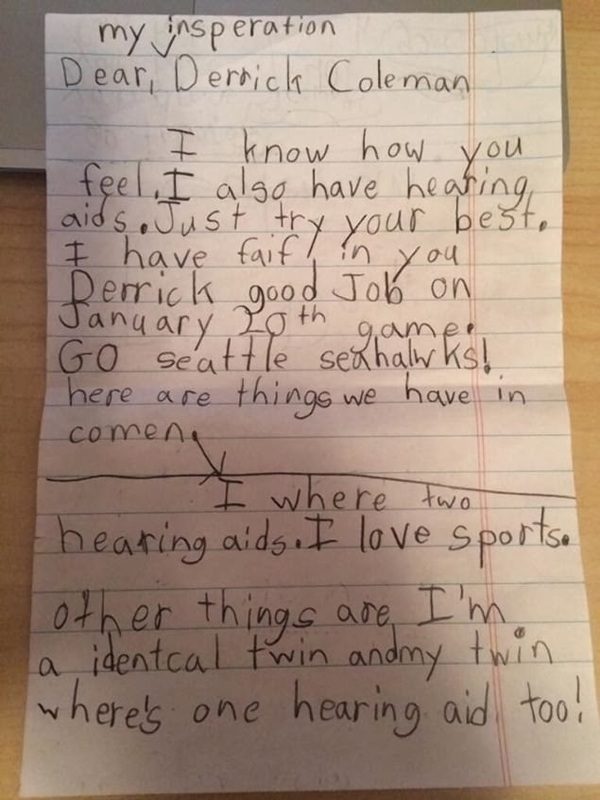 "I have faith in you Derrick." The letter was sent via Twitter by Riley's father, Jake. He told the New York Daily News on Wednesday that he posted the letter to show Coleman how much of an inspiration he is for kids. Coleman posted his letter to Twitter on Wednesday so she could see his response. Read more here. One year ago today (Jan. 21, 2013) the presidential inauguration of Barack Obama for his second term included a closed captioning first--attendees were able to read closed captioning of the proceedings on their smartphones. It is one of several innovations that organizers added to make the inauguration more accessible than any before it. A UK deaf couple didn't have an interpreter when their son was born at a London hospital last month, according to The Guardian. The 12-year-old daughter Hulusi Bati was forced to interpret for him and and Nadia Hassan at University College hospital when the labor ran into complications. The hospital says there wasn't time to get an interpreter on short notice. But no interpreter was provided most of the time during the baby's week-long stay at the hospital either. Bati said, "There was a lot of panic and they brought in my wife's sister-in-law to interpret but she's not an interpreter at all. She only knows the basics so there was no accurate medical information. I felt completely at a loss. I wasn't part of it." Read the full story here. the "Wilt Chamberlain of the deaf"
Perhaps the greatest high school basketball player of all time in the state of Arkansas history was deaf. It was on n this date (January 19, 1971-which is given here though the National Federation of State High School Associations says the game occurred on December 4, 1971) that Bennie Fuller score 102 points in a game against Leola that was played at Arkadelphia. Only three basketball players in U.S. history have scored more points in a high school career than Bennie Fuller did. 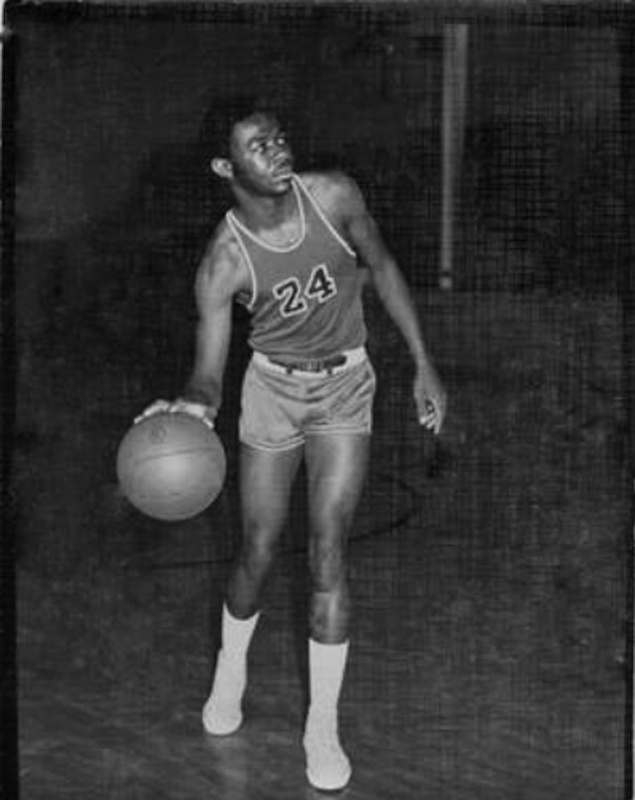 Between 1968 and 1971, the 6-foot-2 guard scored 4,896 points for the Arkansas School for the Deaf becoming known as the "Wilt Chamberlain of the deaf." Now living in Oklahoma, Fuller sadly lost him home in 2013 to a tornado. He averaged more than 50 points a game that season. He was offered more than 100 scholarships to college but he ended up at Pensacola Junior College. He later worked for the US Postal Service and had four hearing children with his wife. Tribes, a show that features a deaf actor in a lead role "falls short," according to a revew in Rhode Island's Providence Journal. Actor Joseph Ausanio was brought in from New York to play the deaf sibling in the Theatre 82 production. Reviewer Channing Gray says, "The point of the play often gets obscured by family stuff and (the writer's) inability to really bring focus to her script." Read the full review here. Tribes is playing at Theater 82 in Cranston and you can purchase tickets here. The video about Derrick Coleman's journey from a deaf childhood to a NFL running back has more than 5 million views in less than a week. We shared the video with you on Sunday (you can see it here). His team is now just a single win away from getting to the Super Bowl--which would be another first for a deaf player. Here's a video report from CBS News about Coleman. Davenport, Iowa is formally apologizing to one-time alderman Keith Meyer. It's part of an out-of-court settlement for an employee knocking softly on the hard of hearing man's door. The city will also pay Meyer nearly $50,00o dollars. You can read the apology here and details about the incident in the Quad City Times here. A San Francisco-area man is suing a hotel in Foster City, California. Todd Rich asked for assistive listening devices and got smoke detectors instead. He was at the Crowne Plaza Hotel for a seminar put on by Success Strategies Institute. Read more on the case in the Daily Journal here. Police claim Pearl Pearson left the scene of a minor car accident in Oklahoma City. The police report says he "refused to comply with officers and refused to comply with repeated orders to display his hands." But what it doesn't say his that Pearson is deaf. An advocacy group is planning a fund-raiser for Pearson, which you can read about here. Watch the story in a video from KFOR-TV below (no captions) or read it here. Carol Padden is rising in the ranks at UC San Diego. The sign-language expert and MacArthur Foundation "genius" grant recipients will serve as the school's Interim Vice Chancellor for Equity, Diversity and Inclusion. Dr. Padden has been a faculty member for three decades. Read more about her appointment here. Some 100 swimmers from nine different countries have gathered in upstate New York where the National Technical Institute for the Deaf, a college of Rochester Institute of Technology, is hosting the U.S. deaf international short course swimming championships. The event starts this afternoon and runs through Saturday. Read more about it here. Roman Erikhman is battling his condo board over his service dog in New York City. The deaf grandfather filed a lawsuit after his was told by the Cove Club Condominium board to get rid of his Doberman Pinscher. Read more on the story from DNAinfo. The IRS's new, simplified option for claiming a home office deduction greatly reduces paperwork and recordkeeping, but some restrictions apply. HEre's an ASL video about it. An Australia woman is appealing her rejection from jury duty--because she is deaf. Gaye Prudence Lyons was called for duty in 2012, but "was excluded after revealing she was deaf and would require Auslan (Australian Sign Language) interpreters" according to News.com.au. Read more here. We first told you about Derrick Coleman in 2008 when he was running for UCLA's football team (here). In December, we shared with you how he is inspiring students (here) as an NFL running back. Coleman was diagnosed with hearing problems when he was about one year old and started wearing hearing aids at the age of four. A short video about Coleman has gone viral (more than 1 million views in its first couple of days) and you can see it below. The Sporting News has an interview with Coleman about the video here. There's a new Saudi Sign Language Dictionary--for the first time. Put together by the Saudi Association for Hearing Impairment, the dictionary has 2,700 sign words and a manual dictionary that includes the alphabet, numbers, more than 750 sign words and native phrases. Read more here. Find out how you or your child can get a tax credit for going to college or some other post-secondary education institution in this ASL video from the IRS. Find out how to make tax payment arrangements online in this IRS video in ASL. 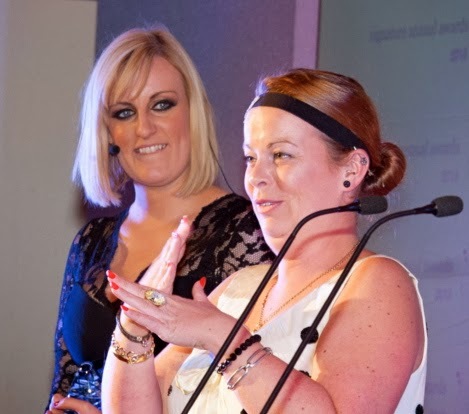 A charity organization called Signature has picked a London sign language teacher as its teacher of the year. Catherine Drew teaches at the Frank Barnes School for Deaf Children. A former student nominated her and a ceremony took place in Bloomsbury, a part of the London Borough of Camden. Catherine leads the Deaf studies and BSL courses at the school for not only pupils, but parents and local community members as well. It was her little brother that "knocked on the door of 10 Downing Street" a decade ago "to hand in to the Prime Minister the petition requesting recognition of BSL and outlining the needs of the Deaf Community." Learn more about the Catherine and other winners here. During the stage production of Tribes, a young man explodes in sign at his father--who learns Chinese but is unwilling to study sign language. In the Steppenwolf Theatre production of the show, taking place in Chicago right now, John McGinty plays Billy. He tells the Chicago Tribune "I don't think the hearing audience fully understands the implicit slight there. But when we have deaf people in our audience, we really can feel their reaction." Read the full article here. There's a battle brewing over a deaf center on New York's Coney Island. A group representing other businesses do not want the Deaf and Wellness Recreation Center to open. They've complained to city that breaks the building codes of the Island because, they say, the only businesses that are to be allowed are supposed to have an entertainment focus. The Center's leadership defends the outreach, saying it IS a entertainment center--for the deaf and the elderly. You'll find the Center's website here. The Brooklyn Paper has more on the controversy here. Uncle Henry got the gift he wanted for Christmas. A video of him getting it has more than 2 millions hits on YouTube in just three days. A family member writes, “For some background on this video and my uncle – Henry is hearing [and] speech impaired. He has a heart of gold and everyone who meets Henry absolutely loves him. Henry is also a kid at heart and loves Hot Wheels, cars and especially games on his iPhone. Because we appreciate Henry so much and wanted to show him how much he is loved, we all pitched in and got Henry the ultimate gift (as you can see, he was quite happy),” the family member continued. One young girl went out of her way to ensure a Christmas Spectacular in Kansas included captioning. WDAF-TV explains how in the video below. No captions but you can read the story here. A kindergartner in suburban Atlanta is adjusting well to his cochlear implants--after his family's insurance company first refused to pay for the procedure. But earlier this year, ABC News did a piece on it and the company changed its mind. ABC has a video update on Carson Rubin's story below (captions available). Here is a look at the 5 types of hearing aid models along with their advantages and costs. ▪ BTEs "behind the ear" These are the familiar crescent-shaped instruments first developed in the late 1940s. These durable aids include a receiver, microphone and amplifier that fits over the ear. The small plastic case is worn behind the ear and connects to an ear mold inside the ear. It directs sound into the ear canal through a tube and custom-fitted ear mold. The most options and is easiest to handle. Picks up sound and processes it into electrical impulses that are sent through a wire to the speaker. Cost: $500 to $2,900 per ear. ▪ "mini" BTEs or OTE (on the ear) These are the newest aids. They dramatically reduces the size of the crescent and replaces the bulky wire and speaker with a clear, thin tube. They cost $700 to $2,350 per ear.ITEs "in-the-ear" Smaller than BTEs, these fit into the outer ear and project slightly into the ear canal. Fairly easy to handle and comes with many features. These can be ordered with or without dual microphones, which provide information to the computer to analyze and reduce background noise. It comes in full shell size and the smaller, less-visible "half shell" size. Cost: $500 to $2,400 per ear. ▪ ITCs "in the canal" This variation on the in-the-ear models protrudes only slightly into the outer ear. They are partially visible though smaller than ITEs. Not for people with severe or profound hearing loss. Fewer features and more difficult to handle. Cost: $650 to $2,350 per ear. ▪ CIC "completely in canal" The smallest but most difficult to handle model, these customized hearing aids are tucked so far down that it comes with a plastic thread to pull it out; They are rarely visible. Not for people with severe or profound hearing loss, smaller batteries with short life; will last no more than 7 years. Impressions are taken of the ear canal to fashion the aids. Cost: $500 to $2,900 per ear. ▪ IOT "invisible open technology" A one-size-fits-all model, these aids are a variation on CIC aids but are not custom-fitted. Sometimes referred to as "fit-and-go," it can be programmed in in one visit to a hearing aid center. Cost: $1,500 to $1,900 per ear. On this date (Jan 8) in 1913, a deaf man saved himself and three others after an elevator plunged four floors in New York City. Henry Souwein was the only one still conscience. He was able to squeeze his hand into the only space rescuers could see. Someone who knew sign language was able to communicate with him, understanding his call for help, leading to everyone being rescued safely from the car. YouTube's biggest competitor, Vimeo, rebuilt its video player and, for the first time, it supports translated subtitles and closed captioning. Users will still have to create and upload the captioning, but at least the process has begin. The biggest difference is rooted in the decision by the company to switch from Flash to HTML5. As a result, videos will load faster, whether viewed on the Vimeo site or elsewhere. Vimeo is working on voice over support as well. You can read more here or watch a Vimeo video about the changes below. TV Closed Captioning Rules in U.S.
All the FCC's captioning rules have kicked in for video that has been shown on TV and is now available on the Internet. So during 2014, all full-length prerecorded video programming as well as all live programming--must have closed captions IF the programming was shown on television in the US with captions since September 30, 2012. If the program was shown on TV with captions since September 30, 2013, and the programs has been edited especially for Internet, then the Internet version must also be captioned. Wilton McMillan says, “I’m so passionate. Passionate for how we can get every single deaf and hard of hearing child to be truly bilingual.” The director of outreach for statewide support services at Kentucky School for the Deaf, McMillan tells Kentucky's Advocate Messenger he relishes his role as an encourager. Born deaf but raised by hearing parents, he understands the struggles that can sometimes arise for deaf and hard of hearing children. Read his full profile in the AM here. NPR is getting an award for its FM receiver to be used as part of an emergency alerting system for the deaf. The Consumer Electronics Association is making NPR labs an Innovations 2014 Design and Engineering Awards Honoree. The award will be presented at the CEA annual conference, which starts tomorrow in Las Vegas. 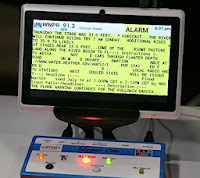 The closed-captioned radio is a standalone box intended to supply emergency information whenever the power is out and WiFi isn't working. Right now, those emergency alerts are the only thing being offered, but NPR says it intends to eventually offer captioning for most of its programming. The device is being tested now along the Gulf Coast. Read more information here. There are only a couple of hundred people like Jared Allebest in the country--profoundly deaf without hearing aids as well as a lawyer. Deseret News says from his private practice in Salt Lake City, Jared has taken cases to trial in Ogden, Provo and Salt Lake. After struggling to find a job after finishing law school, Jared discovered, 'The answer was underneath my nose: I can work for deaf people. I have the skill and I know their world. I don’t want to be typecast (as an attorney only for the deaf), but my calling is to be a bridge between the deaf and the hearing.” Read the full story here. While several videos of sign language interpreters at concerts have gone viral in the U.S., interpreting music in Germany is considered worthwhile by many venues. Interpreter Laura Schwengber says, "They raised all sorts of objections, saying that an extra person wouldn't fit on stage, that it would distract from the band, that it would turn the event into a show just for disabled people. The organizers were basically worried what the reaction would be." Find out how she's made a breakthrough in an article from German international broadcaster Deutsche Welle here. Below is a video of Schwengber interpreting the music of Keimzeit. My parents and many of their deaf friends have.. been handed menus in Braille, offered wheelchairs at airports and questioned about whether they can drive. It seems people will continue to be misinformed about deaf people and deaf culture when things like this are happening. Deaf people are often misjudged. They are pegged as unable when they are forced to sit in wheelchairs and strolled across the airport when their legs work just fine.. They are pegged as rude when at the grocery store they can’t hear the person behind them saying excuse me and they don’t move. But deaf people are not disabled or weird or rude. A deaf person, as my mom puts it, can do anything a hearing person can do — except hear. Read Kayla's entire piece here. 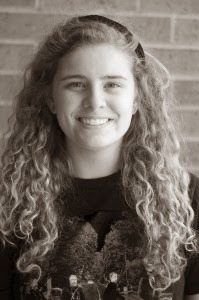 Besides writing columns for the Dallas newspaper, she's an editor for her high school newspaper, too. Inmates in Kentucky are suing to get interpreters when they have medical services provided for them, as well as video phones. Inmates Oscar Adams and Michael Knights say it's a volition of ADA law that prevents them from fully communicating, not only with doctors and family, but also prevents them from being involved with the educational services offered in prisons. Read more here. Tribes opens at the Studio Theater in Washington, DC this Wednesday and runs through February 23. The comedy-drama features deaf actors--including 2011 Gallaudet graduate Joey Caverly, will have 11 performances signed or captioned. The Washington Post offers a look behind the scenes at the production here or you can get tickets here. A sign language interpreter is being credited with stopping a school bus filled with students from flipping over. A bus filled with fourth graders from Pinckney Elementary in Mt. Pleasant, South Carolina with students was headed back from a field trip when the driver lost control and rolled the vehicle into a ditch. 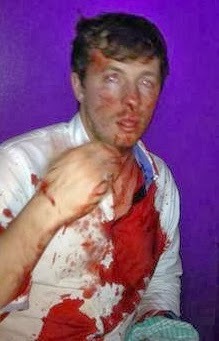 That's when Lee Morris jumped into action. Watch the video below from the Post and Courier to see what Morris did next and read more details from the newspaper here. What if you suspect someone's "service dog" is just a regular pet, and its owner is faking a disability so they can take their dog wherever they want? KUSA-TV has a video report. No captions, but you can read the story here. Taiwanese President Ma Ying-jeou choose not to have a sign language interpreter for his New Year’s address and this has upset the Taiwan Association for Disability Rights. Read what the group's Secretary General, Wang Yuling, has to say about that decision in the Taipei Times.